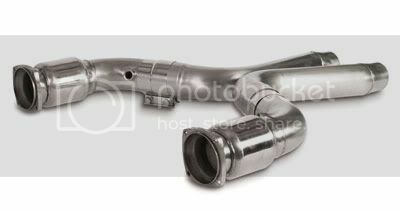 This Dynatech High Flow Catted X-Pipe is designed to bolt right up to the Dynatech 1 7/8 Longtube Headers. No cutting or welding is required. Ceramic catalytic converters. The design of the cats means better heat dispersion, and the internal coating cleans the exhaust, while maximizing flow-through rate. Durable construction. The X-Pipe's 3" diameter is consistent throughout the length of the pipe, even at bend points. What does this mean? Excellent flow-through from the cats to the muffler flanges, which results in increased horsepower where it counts - at the rear wheels, not robbed from the engine by a restrictive exhaust.